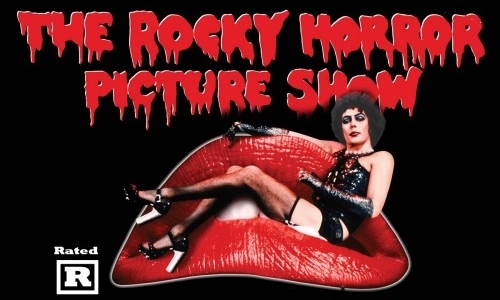 This October, come out and celebrate the 41st anniversary of the Rocky Horror Picture Show! The Nevada Theatre Film Series and Nevada City Live present this cult classic film complete with a live all-star shadow cast performing live on stage at the Nevada Theatre. Rocky Horror Picture Show was the film that launched the Nevada Theatre Film Series back in 1979, and has a cult following virtually unmatched by any other film. What began as a flop when it opened in theaters in 1975 evolved into a phenomenon that happened in movie theaters around the country every Saturday at midnight for decades, and is still going on in some cities today. “If you’ve never seen Rocky Horror live on a stage, you’ve never seen Rocky Horror,” says Director Cosmo Merryweather. As Brad (Barry Bostwick) and Janet (Susan Sarandon) come upon the creepy castle of flamboyant transvestite scientist Dr. Frank-N-Furter (Tim Curry) on the big screen, their counterparts on stage will act it all out for you in living flesh. The show features tongue-in-cheek comedy and Broadway style song and dance, with plenty of audience participation. Audiences are invited to come as you are or dressed up and ready to do the Time Warp all over again!